Here's a FAQ and guide on how to earn fast Coins and Legendary Cars in the real time multiplayer racing game - Crash of Cars. 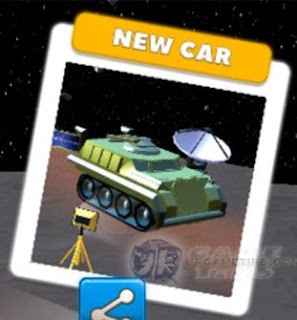 - Earn Prestige Points to upgrade your Prestige Lvl, do this by getting cars from Machines using your hard earned Coins. - Note that the game will also offer "free pulls" as you go through the game. - A list of prizes that you can randomly get after leveling your Prestige Lvl. - These can be new weapon versions or upgrades, prestige cars, skins, and more (looks random). Unlock everything to make your cars and weapons stronger. - This is the only way that you can unlock prestige cars like "The Muscle", after that, you can now upgrade them from machines pulls. - It is also possible to draw Epic and Legendary Cars here, just keep on pulling as you go. - Note that any cars will do, there is no need to reset anything in this game, just keep on farming and pulling more cars. - Can be used on to draw from Machines if you want, but for F2P players, it's best to earn your Gems to get Legendary Cars at higher levels! (plus new skin and lots of Prestige Points). - 5 Free gems can be obtained as you increase your Prestige Lvl. - If you can still draw duplicates even if your car is maxed, that duplicate will turn into a Gem. - Obtained from Machines draws, buy with Coins or Gems, or upgrade Prestige to unlock some free Skins. - Skins are used to customize your rides. How to Earn Fast Coins? 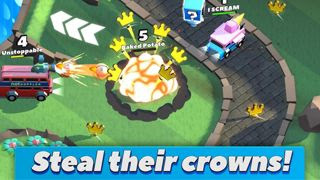 - Collect crowns during battle, the more Crowns you get, the better. 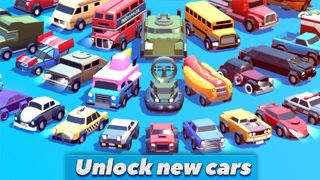 - Defeat enemy cars to collect their Crowns too! The number above them is the number of Crowns they currently have, aim for those cars before someone else does. - If available, watch Video Ads every after battle to get fast Coins early game. - Tip: You can purposely let your own Car fall off cliffs or drown into the water for example, to quickly end the battle, this way you can trigger more Video Ads. This is your best choice if you still can't survive the heat of battle. - Blank Screen Ads Problem: Just restart, but if you are still getting this error, try to close the game then go to it's App Settings > Select the "Clear Cache", then restart the game. - Open "Free Gifts" whenever you get the chance for more free Coins too. - You can earn extra Coins if you connect this game to your Facebook account, and earn bonus Coins for every friend that joins! - Share your achievements too for more free Coins. - Daily missions is another way to earn some extra Coins, complete them to learn how to drive your cars and survive longer. 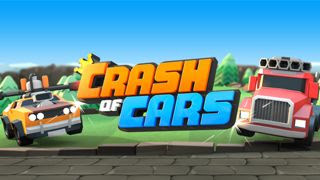 - Use faster cars to easily avoid chasing cars, and other attacks that you might encounter. - Alternatively, you can also use faster cars to chase down weak targets. - Cars with high HP or number of Health Bars are also good to stay longer in battle, but still be careful because most of them are a bit large and slow which will also make them an easy target. - So it is also a good idea that you increase the Shield bars of your faster cars by getting dupes from machines. It's random though but keep going and use the best one available for your playing style. - Small Cars will also get an advantage because of their size and speed which will make them harder to target or chase, the only drawback is that they are harder to control and they usually have lower HP. - They are more like a hit and run type cars, avoid crashes since they have low HP (vulnerable from Homing Missiles). - These cars are also excellent if you can upgrade them enough, and the best thing is that, most of them have a nice extra effect that could be really useful while in battle. - Most of these cars are either very fast, sturdy, has high survivability, or with insane damage potential. Keep going and hope to draw them from machines! - Leveling up these cars should also be one of your end game goals. - Can be used as an escape mechanism, or if you can aim it well then use it to chase or defeat enemies. - Best use while you are alone. - Massive damages if you land into someone, time it well and try to dive into big crashes. - Aim well, best at close range to sink in all cannons. - Rear Cannons works well against chasing cars too. - Best used when an enemy is in range. - Can be dodged if you just spin around and hope the missile will hit someone or other objects around like walls. - Nice for big crashes, cancel it out to release them on the ground, you won't get hit if you do this. - Best used by faster cars, because they can easily chase targets. - Once you are able to freeze someone, quickly bump into them to easily crash their car. - Can be used as a shield since you won't get hit by this. - Note: Slow cars sometimes can't deal damages even if you bump into frozen cars! - Aim it well, and hope to hit enemies in contact! - Nice for big crashes, cancel it out to release those Spikes in front of you. - Nice for big crashes since you won't get hit by this. - Also good for hit and run style. - Activate to lay traps (near power-up boxes, bridges, ramps, and more), or use if someone is chasing you. Be careful because you can also get hit by these if triggered. - Fast cars can drive through landmines without getting hurt though. - Used to negate all incoming damages, time it well and use if you are about to get crashed by multiple enemy cars. - You can also activate this then go crash enemies, best paired with any offensive type weapons after the shield wears off. - Bump into explosive objects while an enemy is around too!